After reading four non-fiction books in a row, thereby nearly guaranteeing my goal of "1/3 of my books read this year should be non-fiction," I needed brain candy. I needed a book that was just plain fluff, that wasn't going to be anything but an adventure. 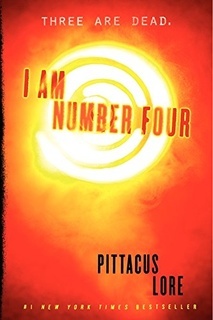 I had I am Number Four on my list for a bit, likely some Book Riot recommendation, and had started reading it in Montreal when Snook and Ara were busy catching up on tattoos and such in the local bookstore's Starbucks. I had read up to page 47 in the book, and wanted to continue it. TMI? Possibly, but it wins me brownie points. My plan was to read this book today (check), and watch the movie tonight (less check). The former I managed, the latter I mostly managed. The book is better. Way better. Anyway, there are 18 known inhabitable planets in the universe (how they know this in the UNIVERSE and not merely our galaxy, I have no idea, but let's go with it, this is brain candy, not discovering gravitational waves or some such. One of them was destroyed by its own race, which then destroyed a second of them, and is coming for its third, Earth. The previous planet's occupants had some pretty fantastic abilities, and these are what John Smith, the 15 year old protagonist, might developer. Or maybe does develop? Okay, fine he does. The book was exactly what I needed, brain candy. The movie was an experience in frustration and confusion - why would they change the father-son, guardian-trustee, friendly relationship between Henri and John in the book, and make it adversarial and secretive in the movie? The change did not improve the movie at all. If you're a fan of science fiction, this is a fast, easy read. If not, skip it, and likely the remaining six books in the series. I'll be skipping the remaining six books myself. Sarah laughs. She places a new egg in my hand and takes my hand in hers and shows me how to crack it on the rim of the bowl. No, that is a crappy way to break an egg. Breaking an egg along the rim of a bowl shatters the shell, increasing the likelihood of shell in your bowl and your batter (or whatever you have in the bowl). Crack the egg by knocking it against the countertop to create a broken flat area of shell. Press both thumbs into this broken circle area, and pry apart as if the egg has a hinge on the opposite side of the egg from the broken flat area where you are putting your thumbs. "She was a late sleeper, and I always woke before she did. I would sit in the den and read the paper, make breakfast, go for a walk. Some mornings I would come back and she would still be sleeping. I was impatient, couldn't wait to start the day together. She made me feel good just to be around her. I would go in and try to rouse her. She would pull the covers over her head and growl at me. Almost every morning, always the same thing." "Hope?" he says. "There is always hope, John. New developments have yet to present themselves. Not all the information is in. No. Don't give up hope just yet. It's the last thing to go. When you have lost hope, you have lost everything. And when you think all is lost, when all is dire and bleak, there is always hope." "Do you think it's possible for us to be loved?" I ask. "By humans. Do you think we can be loved, like, truly be loved by them?" "I think they can love us the way they love each other, especially if they don't know what we are, but I don't think it's possible to love a human the way you would love a Loric," he says. "Because deep down we're different from them. And we love differently. One of the gifts our planet gave us is to love completely. Without jealousy or insecurity or fear. Without pettiness. Without anger. You may have strong feelings for Sara, but they aren't what you would feel for a Loric girl." Can you imagine such a love? "What happens if we try to have children with humans?" "It's happened many times before. Usually it results in an exceptional and gifted human. Some of the greatest figures in Earth's history were actually the product of humans and the Loric, including Buddha, Aristotle, Julius Caesar, Alexander the Great, Genghis Khan, Leonardo da Vinci, Isaac Newton, THomas Jefferson, and Albert Einstein..."
"No more running. No more fighting. Blood from the knife wound runs down my back; my hands and legs are both shaking. The dagger is still tucked into the waistband of my jeans, but what's the point in grabbing it? What faith is there in a four-inch blade against a forty-foot beast? It would be the equivalent of a splinter. It'll only make it angrier. My only hope is to bleed to death before I am killed and eaten. I close my eyes and accept death. My lights are off. I don'ot want to see what is about to happen." Geez, this kid accepts his death easily. And repeatedly. He kept accepting it, and accepting it, and accepting it, even as everyone around him kept fighting. Maybe Henri should have worked on those grit lessons, too.